Beautiful, century old oceanfront home. The old Winsloe House is a 110 year old country home that has recently been refurbished and modernised. It is located on the coast in Guernsey Cove, 20 minutes from Wood Islands ferry on Route 18, and 5 KM from the in nearby town of Murray Harbour. The house is furnished to Canada Select 4-star standards and contains 4 charming bedrooms each with en-suite bathroom with shower/mini bath, WC, washbasin; satellite TV. The house also has wireless Internet access for guests. Although a country area you are close to the small fishing town of Murray Harbour, golf courses, The Confederation Trail for hiking and biking, seal & whale watching, fishing, lighthouses, a winery, restaurants and shop. The larger town of Montague is within 30 minutes drive, and the province capital Charlottetown within an hour. Nature lovers will be well rewarded by coastal views, and the opportunity to see whales, seals, dolphins, porpoises, herons, pelicans, cormorants to name but a few. We do our best to meet all of our guests needs, if you require any special arrangements, or would like to book the property for an event, please contact us and we will do our best to help. toilet, Extra downstairs bathroom for convenience. There is a fire pit in the garden, a beautiful spot to sit out and watch the stars, ships go by along the straits, or just chat with a beer. This is a beautiful, tastefully renovated century old home. The home has been renovated while maintaining the charm of the era when it was built. There is a four piece bath in each of the four bedrooms. The kitchen is very large and extremely well equipped. The home would be well suited for four golfing couples. There are lots of great courses within an hours drive. The shore is on the property and extremely beautiful but really not that suitable for swimming. A nice addition to the shore area would be a gazebo. This place is beautiful and well equipped but not so pretentious that you don’t feel as though you can vacation comfortably in it. My family and I just spent a week at the Olde Winsloe House and could not have had a better experience. The house is located on a very large, quiet lot and the house is superb. Every room was bright and immaculately clean. Each bedroom had very comfy beds and lovely bathrooms. The kitchen is very large and equipped with beautiful appliances and accessories that surpassed all our needs. The property manager, Paula, is very helpful and responsive if you have any questions. There is a lovely little beach down a short path on the property and a bigger, beautiful sandy beach only a four minute drive away. The cottage is a perfect location for sunning on the quiet deck or going to play in the waves. We could not have been happier and will be sure to return. Our family LOVED this spot. Absolutely no complaints. Host was very responsive, space was super clean. A well stocked kitchen. Great location. We will definitely stay here again! Very beautiful house and property. Best we've found in 14 years in the area! I've been hosting a golf weekend in eastern PEI for guys from all around the world for 14 years now and each year we've struggled to find good accommodations in the Murray Harbour area ... until we found the old Winsloe House. We rented the entire house and the carriage house and it was perfect for 5 guys - each with his own bedroom. Despite being 100 years old, the house has been impeccably renovated and modernized with all new furniture. 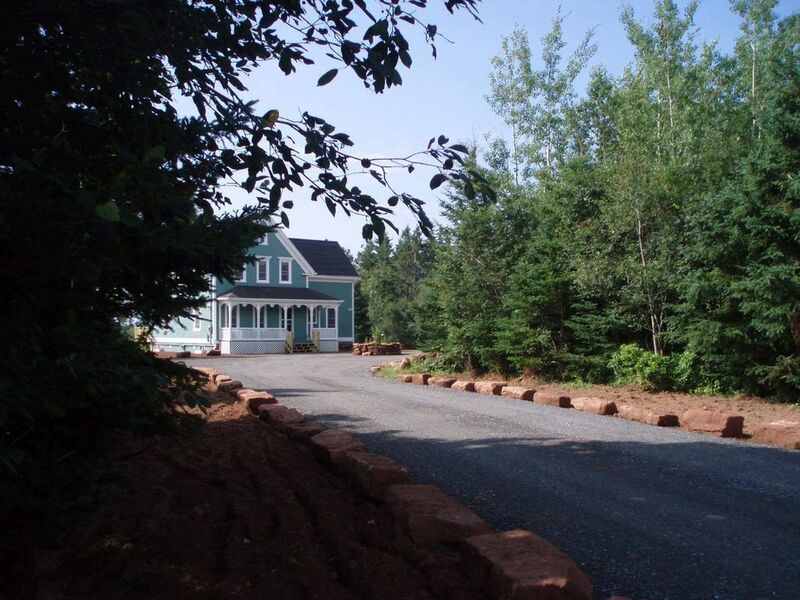 It sits on a property that has direct access to the shore and the ocean and is in an area that is a bit of hidden gem in PEI. For our purposes, only 30 minutes to great golf at Brudenell/Dundarave. The host was very attentive to our needs and very responsive. We're definitely coming back next year! We stayed in Old Winsloe House with another family - four adults and three kids in total - and it was a wonderful experience! The house had recently been sold to a new owner and we were his first guests. When we arrived Paul told us to let him know if anything was missing as he had tried to think of everything, but was sure that he had not. We soon found a few things missing, such as handsoap and garbage cans in the bathrooms, and when we came back later that same day Paul had supplied these along with bedside lamps. The house was spacious with a well stocked kitchen and there was plenty of room for all seven of us. The location is secluded, but the coast around this area of the island is quite spectacular with red sand and rolling fields. The house has direct beach access down a set of stairs at the rear of the property, and there is a more accessible beach a hundred metres down the road. Although tucked away in the southeast corner of the island, almost anywhere in PEI is within an hour and a half's drive. We visited the north shore beaches, Charlottetown, and several lighthouses. We had a particularly fine dinner at the restaurant next to Point Prim Lighthouse (Point Prim Chowder House). Golfing is also nearby with courses for all levels within half an hour's drive. We had a lovely time here and would highly recommend it. Paul was a responsive and helpful owner. If we return to PEI we will certainly be renting this house again!